Art in Context features painting, drawing, photography, and sculpture by Audrey Barcio, Lynda Benglis, Claudia DeMonte, Chris Duncan, Justin Favela, Jenna Gribbon, Clarity Haynes, Danielle Kelly, Javier Sanchez, Nicolas Shake, Laurens Tan, and Mikayla Whitmore. Photo | Justin Locust. Claudia DeMonte, Untitled (Claudia Watching TV), 1986, Papier-mâché (celluclay), acrylic and glue, The Dorothy & Herbert Vogel Collection: Fifty Works for Fifty States. Photo | Justin Locust. 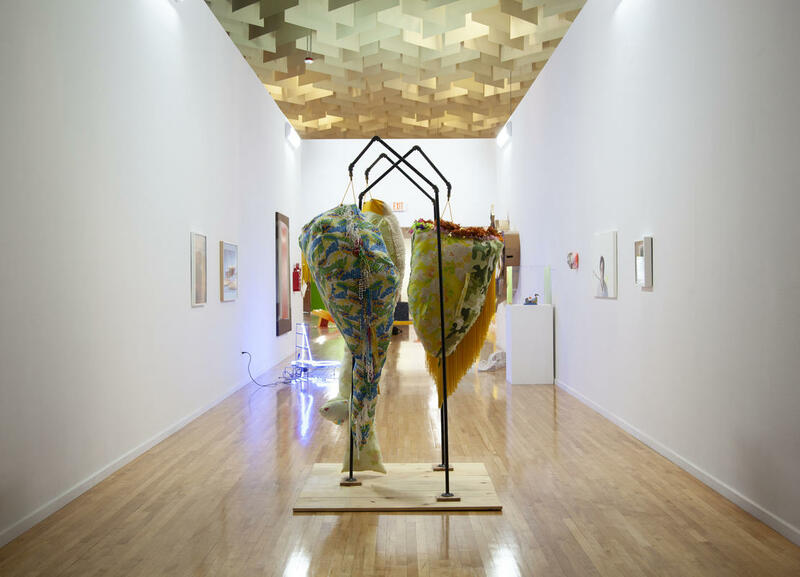 This pop-up exhibition gives visitors a chance to see some of the work being studied by Wendy Kveck’s UNLV Art in Context class. Choosing her examples from both the Barrick Collection and the Dorothy and Herbert Vogel Collection held at the museum, Kveck asks her students to consider the increasingly interdisciplinary nature of artists’ practices, and the impact of personal and global influences on contemporary artwork. Art in Context features painting, drawing, photography, and sculpture by Audrey Barcio, Lynda Benglis, Claudia DeMonte, Chris Duncan, Justin Favela, Jenna Gribbon, Clarity Haynes, Danielle Kelly, Javier Sanchez, Nicolas Shake, Laurens Tan, and Mikayla Whitmore. About the course: This exhibition has been produced in partnership with Professor Wendy Kveck and her course Art In Context (ART 434 & 722), which emphasizes the creative and active role that contemporary art plays in engaging audiences and communities to experience, consider, and interact with the world around them in new and meaningful ways. Artists’ practices are increasingly interdisciplinary and their research and art reflective of personal biographies and a shifting and globally influenced cultural landscape at large. In this course, students will develop and hone research skills, mining history and art history, popular culture, the socio-political landscape, psychology, science and other disciplines in order to better understand the context of select works of contemporary art. Student research will be presented in multiple formats: the interview, the essay, and new media formats such as the podcast, blog, and TEDTalk. Art in Context students have a unique opportunity to study and engage with diverse works from the collection of UNLV’s Marjorie Barrick Museum of Art, which encompasses a growing range of contemporary art in various media including painting, drawing, sculpture, and photography, with a special emphasis on work that considers different aspects of life in Las Vegas and Southern Nevada. Students from all disciplines welcome.